Co-organised together with the Ministry of Research and Innovation and the Institute for Nuclear Research from Romania, under the Romanian Presidency of the Council of the EU in 2019, the FISA2019 and EURADWASTE’19 Conferences will take place in Pitesti (Romania), from 4-7 June 2019. 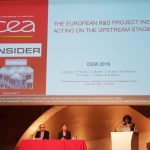 FISA 2019 and EURADWASTE ‘19 will engage with all relevant stakeholders: research and training organisations, academia, industry, technology platforms, European fora and European civil society, and International Organisations to discuss the state of play of R&D, key challenges addressed at national, European and international levels on Research and Innovation policies, synergies and partnerships benefitting research and innovation programmes, and future perspectives. Invited speakers will present the progress and key achievements of some 90 projects carried out, since the previous conference edition in 2013, as part of the 7th and Horizon 2020 Euratom Research and Training Framework Programmes. FISA 2019 and EURADWASTE ’19 will also welcome any complementary abstracts, papers and posters related to the sessions and Euratom projects, and Technical Workshops will be set up. 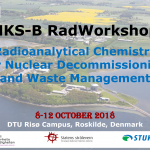 Young generation of nuclear scientists are encouraged to participate in the FISA 2019 and EURADWASTE ‘19 Poster and PhD Awardsto be handed out at this occasion, as well as in the ENEN PhD Event & Prize organised in a parallel session, to promote and support the work of young researchers in Europe. Technical visits to the TRIGA research reactor and Hot Cells facilities (at the Institute for Nuclear Research, Pitesti), Nuclear Fuel Factory (Pitesti), ELI – Extreme Light Infrastructure (in Bucharest-Magurele), and Cernavoda NPP and Waste Management facilities (Cernavoda–Constanta) will be organised on June the 7th.